NORTH OLMSTED, Ohio - Oct. 13, 2015 – With the initial release of the AccuBrine® automated brine maker, Cargill Deicing Technology demonstrated the valuable time and money to be saved with a fully-automated system. Today there are more options of brine makers available than ever before and as customers’ needs grow, so has one of the most recognized names in the winter maintenance industry. After undergoing several key improvements, the all-new AccuBrine® automated brine maker NXT-Gen produces greater benefits for customers such as enhanced brine making efficiency and better truck loading accuracy. In addition, the redesigned operator interface screen layout and new PLC program provides a cleaner screen layout and organization that is easier to navigate. The all-new AccuBrine® automated brine maker NXT-Gen produces greater benefits for customers such as enhanced brine making efficiency and better truck loading accuracy. 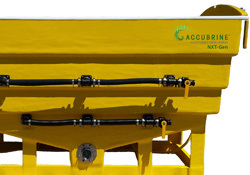 The AccuBrine® blend truck loading & blending system can be easily paired with the AccuBrine® automated brine maker NXT-Gen and allows users to create as many customized liquid blends as needed. Using an in-line volume ratio blending method to fill the truck with customized brine blends accurately and quickly, the AccuBrine® truck loading & blending system’s modular design gives users the option to add multiple additives to blend with brine. Cargill Deicing Technology is committed to providing customers with deicing solutions that save lives, enhance commerce and reduce environmental impact. Located in North Olmsted, Ohio, Cargill Deicing Technology understands the science behind ice melters and is committed to sharing that knowledge with customers and using it to improve offerings. As well as the AccuBrine® blending system, Cargill Deicing Technology offers additional products to the winter maintenance industry, including the AccuBrine® automated brine maker NXT, the AccuBatch® brine maker, ClearLane® enhanced deicer, SafeLane® surface overlay and WinterPave® asphalt anti-freeze.